I’m a doctor, teacher, writer, broadcaster, and rather proud mother. This blog is about what I do when I’m not being a medic. But, in case you want to know, I graduated from Cambridge where I studied medicine and my fellow students. It wasn’t a straight path from there to family practice because I spent years in hospital medicine. I’ve also worked at checkouts, typed manuscripts in Russian, walked dogs, and proof-read manuals on building dual-diesel engines. One Night at The Jacaranda is my debut novel. 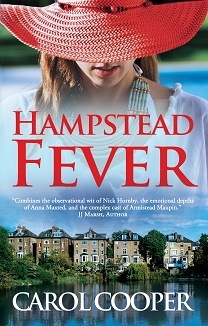 It’s about a group of 30-somethings looking for love, and it’s laced with inside medical knowledge, just like my latest book Hampstead Fever (there’s more on the My books page). From time to time, I let my characters out and allow them to wander around this blog to see what other mischief they get up to. At five, I wrote stories were about witches smoking in bed. These days I’m The Sun newspaper’s doctor, so I get to have my say on important health issues, from radiation spills to models hurting themselves as they stumble out of night-clubs. Most of my books are on child health and parenting. My three sons filled in the gaps in my otherwise superb training, and made sure my books had some proper practical value. I also see patients in the clinic, teach medical students at Imperial College Medical School, and pop up on TV and radio giving medical opinions on topical health issues. Even better, I got married again in 2013. I love a happy ending. Or you may not. So tell me what you’d most like to read. Oh God. Just how multi-talented are you Carol? I am gobsmacked. Honestly. Like I said, I love the name. Congratulations for your happy ending. Actually, happy beginning. Have you written your page? I would have preferred if it were in the first person. Great blog! Makes me want to live in London! Think I may take your advice and break into first person. Just discovered this blog. Love finding inspirational woman to look up to! Where have you been till now! You’re too kind. I think the biog pretty much tells you what’s been keeping me all these years! All the best with the rest of your medical studies, and I hope to keep an eye on your progress. You’re too kind,DC. Thanks for spreading the sunshine, especially in January in the UK! Means a lot. It was a real pleasure taking part in Whose Blog is it Anyway part 2, and anyone in need of entertainment should check out all the contributions there. ..wow…what an inspiring lady you seem to be. Fabulous. Thank you! I just work hard. I’d say!!! 😀 Which is inspiring to keep working hard for what we wish to achieve. See how that works? 😀 Thank you. You’re right. It may be the opposite of a vicious cycle. It WAS a good one though! You have a very nice blog here and you just got a new follower. Thank you very much, Irene. Look forward to checking out more of your jewellery designs. I’m looking forward to read more from you. You are beautiful :). Great blog! Is Russian hard? Thanks again for that. I found Russian hard but Arabic is harder, even though there are many words shared with Spanish. I’m told Chinese is almost impossible, so everything’s relative. Thank you very much! This has definitely cheered me up at the start of a very tough week. I’ll get round to a proper thank you when I can think straight. I may be some time. Love the blog, looking forward to reading your novel! Very kind of you to say so! I hope you enjoy the novel, and when you’re done let me know who your favourite characters are (I’m working on a follow-up title). Thank you very much, DC! You’re too kind. Acceptance post coming up when I can see the wood for the trees, or maybe the angel for the wings. New metaphor, anyone? Thank you so much, DC! What a lovely surprise. Plus butterflies are such gorgeous creatures. Bit like the glorious sunsets that have become your trademark, I think. Hope all is well with you. Inner peace is somewhat elusive lately, I’ve found, so thank you from the bottom of my heart* for this. * This is in the region of the left ventricle. But I’m still not sure where inner peace is. Why thank you, DC *blushes*. I will try to do it justice. Just about to spend a few days sorting out my late mother’s things but acceptance post will follow shortly. Inner peace would be fab, wouldn’t it, Don? Some outer peace would be a great thing too but it seems just as elusive… Hope you’re well, and please keep on doing what you do.